I'm kind of cheating today and am recommending a book before I've even read through it all myself, but I just know this is going to become a good reference text for me, will likely appear on the blog at various times, and is worth sharing. 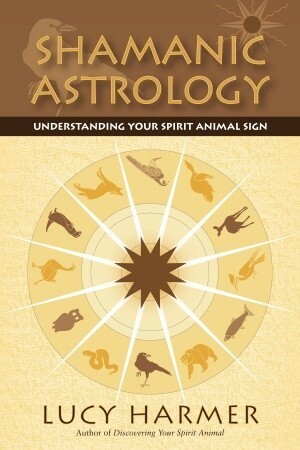 The book by Lucy Harmer is called, "Shamanic Astrology: Understanding Your Spirit Animal Sign". It jumped out at me in the bookstore yesterday so I took it home. Shamanic Astrology is a whole new concept for me. According to Harmer, it has been practiced by Native Americans, and the Toltecs for centuries. Like Western Astrology, Shamanic Astrology is based on the study of the movement of the sun and moon during different seasons of the year. The theory is that the billions of cells that make up our brains and bodies are infused with the influence of the sun and moon cycles at the exact moment of our birth. Harmer describes it like programming a computer. The difference between Western and Shamanic Astrology as explained by Harmer, is that shamanic astrology is "adapted to the energy of the seasons and the elements surrounding us at the moment of our birth". This includes differences according to whether we were born in the Northern or Southern Hemisphere. Furthermore, the qualities and personality traits that tend to be predominant in persons born under certain sun and moon cycles, can be represented by a particular spirit animal. So, as this book explains, there are 12 spirit animals, each one corresponding to one of the Western Astrological Signs. For example, if you were born in the Northern Hemisphere between June 21 and July 21, you would be considered to have the Astrological sign Cancer. You would have, as a spirit animal, the Woodpecker. In the Southern Hemisphere, if you were born between June 21 and July 21, your Western Astrological Sign would still be Cancer, but your Shamanic Spirit Animal would be a Snow Goose, an animal more consistent with the environment of winter. There are a lot of connections throughout this book with environmental influences. Each Spirit Animal Sign also has a corresponding plant, color, and clan. Your spirit animal connection may also explain why you feel differently according to the time of the year or seasons. Personality strengths, weaknesses and tendencies are also revealed. I really found the concept fun and perhaps a bit easier to understand than the depths of Western Astrology. I think it's important to be connected to nature and this book helps explain some of the natural rhythms that we may perhaps be ignoring, or at least, trying to understand. Animals seem to be making their presence clearly known these days. Some of this presence is explained away by saying that we are encroaching in their space, they are adapting to ours, or we are just more conscious of it all. I don't really believe that's the "whole story". I think they have messages for us that we really should, or at least could, pay attention to. So for that reason alone, I like this book. I like the idea of being linked in some way, not only to far away planets, but to a few critters much closer to the ground. I write a lot about animals and animal signs on this blog, and now I have another source of reference to include. I think most people enjoy looking at themselves from a different perspective and perhaps finding confirmation of why you feel or behave the way you do. It's also fun to consider the reactions of those close to you in light of their spirit animals I think. Explains some things in my part of the world I feel!